I was thrilled to attend my first METC (Midwest Education Technology Community) conference, and it was a great experience. We took a team of six from our school, and I think everyone felt it was very beneficial. We really enjoyed sharing what we learned in the different sessions and dreaming about new possibilities for our students and school. Now it's time to take action! Although the conference had incredible information on a variety of digital tools, the ideas on leadership and change were outstanding. As principal, it's very important to me that we provide the leadership and support to see technology efforts thrive, and ultimately to have the best learning environment for students. Here are 17 ideas I can take with me from this conference. Creativity and the desire to learn should be top priorities as outcomes for schooling. And yet, those aspects of learning have not been emphasized in most cases. Student achievement on standards has taken priority over developing passionate learners. 2. Technology in the hands of an innovative teacher is transformational. Technology is not optional. Students are going to need to use tech in creative and powerful ways to create the greatest value now and in the future. But technology alone is not enough. Teachers must use their professional skills to use technology to increase learning. 3. Isolation is the enemy of improvement. Sharing is learning. One of the best ways for new ideas to emerge and then spread is by teachers sharing with each other. The best voice for change is a teacher for whom a change or idea is working for them. 4. Help students be problem finders. Take problem solving a step further. Let your students have experience identifying problems themselves. When students identify problems, they will have greater investment in finding solutions. 5. Innovation starts and ends with empathy. Students will be better at finding problems when they start with empathy. When they understand how someone is suffering or how something isn't working—when they really feel the need—then they will begin to innovate and use their talents to find ways to make the world better. It's time for all teachers to take charge of their own professional development. Professional learning shouldn't be the obligation of the school. Every teacher should try to improve themselves for the good of their students. They should model the type of learning they want from their students. 7. Stop talking about kids as leaders of tomorrow. Our students can be amazing leaders right now. Even the words "student" and "school" have become associated with hints of passiveness and boredom. We need learners in real situations, demonstrating real opportunities for leadership. Get students into the community. Ask them to make change happen and make the world better now. 8. Learning is messy. Change leadership mirrors this also. 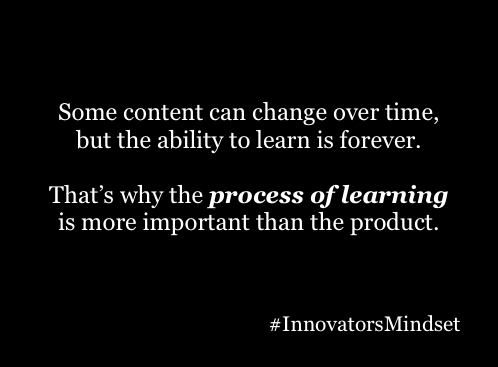 Leaders shouldn't try to control every aspect of learning or change. 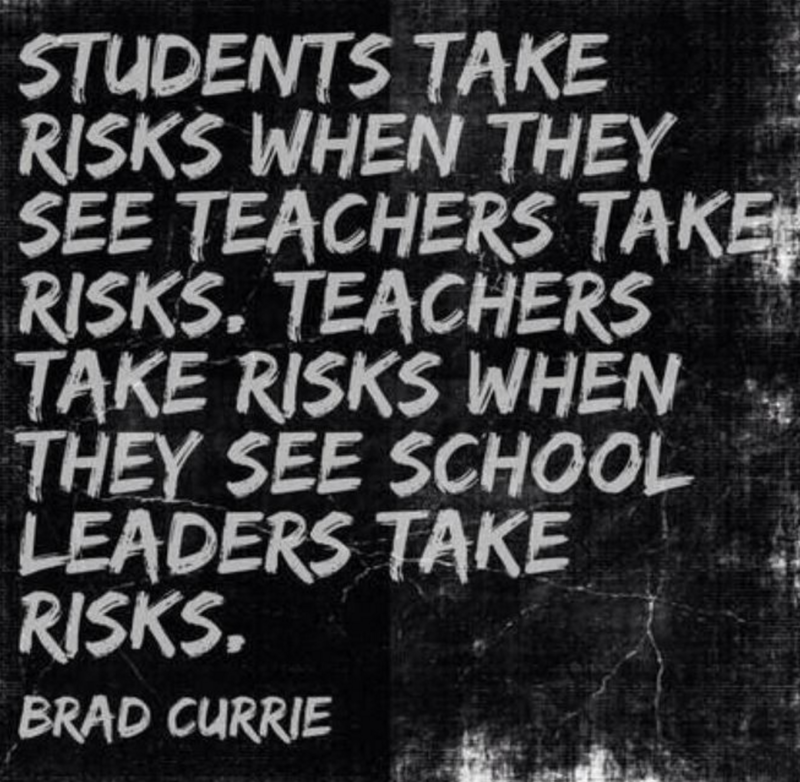 If we create supportive conditions that value risk-taking and new ideas, learning and change will thrive. 9. Leaders help support what others want to do, not what the leader is pressuring them to do. I think this is a big statement. Pressure is not an effective strategy. Let's get behind the hopes and dreams of teachers who are doing the work, and help them reach their goals. 10. Start with strengths and build from there. Is data-driven really code for deficit-driven? No one is inspired by having the weaknesses pointed out. The leaders who inspired us the most, saw our strengths and made us feel 10 feet tall, and then they challenged us to get even better. 11. Make decisions based on the end users (students), not the providers (admin, teachers). Let's remember that our purpose is helping students reach their dreams. And then let's make decisions that support those dreams. Too many decisions are made based on a narrow view of education and the convenience and comfort of administrators and teachers. It's not enough to talk about empowering others. If people don't have the opportunities of choice and voice, it's going to inhibit change. 13. Don't point out problems unless you are willing to offer solutions or seek answers. Pointing out problems without being a problem-solver is just blaming and complaining. 14. Trust and relationships are crucial to learning and change. Relationships, relationships, relationships. It's worth repeating. We must make people our priority. Only when we value people will we see progress. The trust that is established in healthy relationships provides the foundation and safety for giving yourself to a cause. Access and opportunity go hand-in-hand. When students have access to a connected device, they have the opportunity to make a positive difference, both for themselves and those around them. But, it's a choice. Access provides the opportunity. 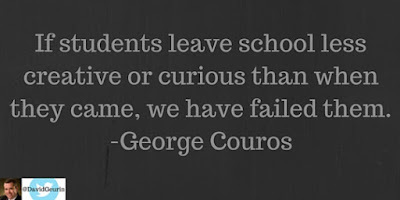 It doesn't guarantee every student will make great choices, but there is opportunity for learning in that too. Maybe learning how to learn should be the greatest desired outcome of schooling? 17. If you aren't facilitating a digitally literate classroom, you are becoming irrelevant. So much of the way the world gets things done is through digital means. If you aren't embracing this fact in your classroom, you are quickly becoming irrelevant. Our students need to see how technology can help them make an impact in the world. And they need you to model it for them. Be a connected educator. These ideas represent my notes and takeaways from the conference. Thanks to George Couros, Rafranz Davis, and other presenters for making it a great learning experience.